Either the doors of this building have been maintained far better than the evidence of urban pollution on the building, or these doors are not original. The double wooden exterior doors form an elliptical arch. Just above is the arch's keystone. Each door has been framed with fourteen square panels. The top two panels of each door are fitted with glass instead of being solid like the rest of the doors' panels. As no other widows are visible on the building's face, these four small windows allow natural light to enter the building without compromising security or privacy. Each of the solid panels has a raised diamond in the center. 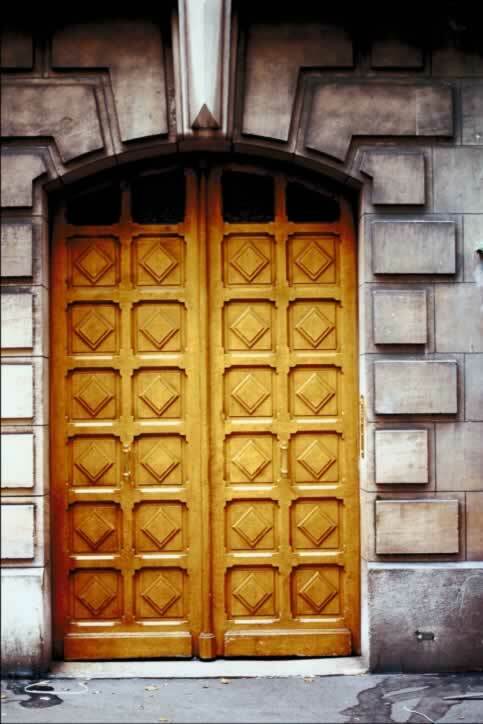 On the middle stile of each door that runs vertically from top to bottom (also called a muntin), is a single polished brass door handle, suggesting doors that open inward.